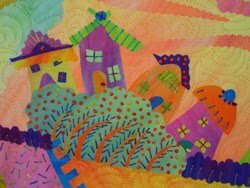 The Irish Patchwork Society has an exhibition of quilts coming up at the Cork Institute of Technology, Bishopstown, Cork. The opening is on Saturday the 4th Sept at 5:00 and the exhibition will run for one week. 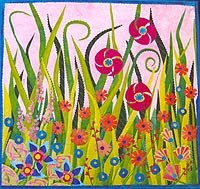 Laura Wasilowski (a well known Art Quilter from America) will be here to give a talk on Saturday afternoon (at 3:00) followed by the official opening. There will be demonstrations on for the day (starting at 11). All are welcome. Moya Geraghty of Patchwork Plus and the IPS Southern Branch have organised a couple of workshops with Laura to take place on Sunday the 5th and Monday the 6th from 10 - 4 at the CIT. The cost for the workshop is €60 including the fabric kit which is to be supplied by Laura.